Our professionals count with extensive experience and knowledge in guided tours in Cordoba are at your disposal. Medina Azahara is an important archaeological site situated 8 km from Cordoba. Explore the history of the opulent city built by Abderraman III in the 10th century and the remains of palaces, grand entrances and gardens, as well as the stories, secrets and marvels held within it. Three guided tours that will show you everything you need to know about the Historical Old Town of Cordoba. Get the three of them at one time and take advantage of a great discount. Behind every whitewashed wall of the most typical quarters of Cordoba you can discover the real treasures of our city: the Patios of Córdoba, declared Intangible Cultural Heritage by UNESCO. Enjoy them out of the high season, avoiding the crowds. Come with us to see this emotional visit to get know the axerquia neighbourhood, the great Corredera square and the famous foul square. Around the tour we will be received by some important people in the past of this city which will make this visit as an unforgetable experience. Are you looking for a guided Tour in Córdoba? The best option is to look for professionals that truly know the city. Eventour Córdoba is a firm composed by professionals devoted to high-quality tourism. Due to its broad experience and knowledge you will be able to enjoy and learn about Cordoba in a single way. It has been always said that, in order to truly know a place, it has to be shown by people who live there. That is what Eventour offers you. Our firm perfeclty fits the single needs of each client. It would seem like friends of yours showing you around the city and its main sights. You will get to know the history and culture of this ancient city. Explore the essential sites to deeply know the city in order to make you feel as part of it. 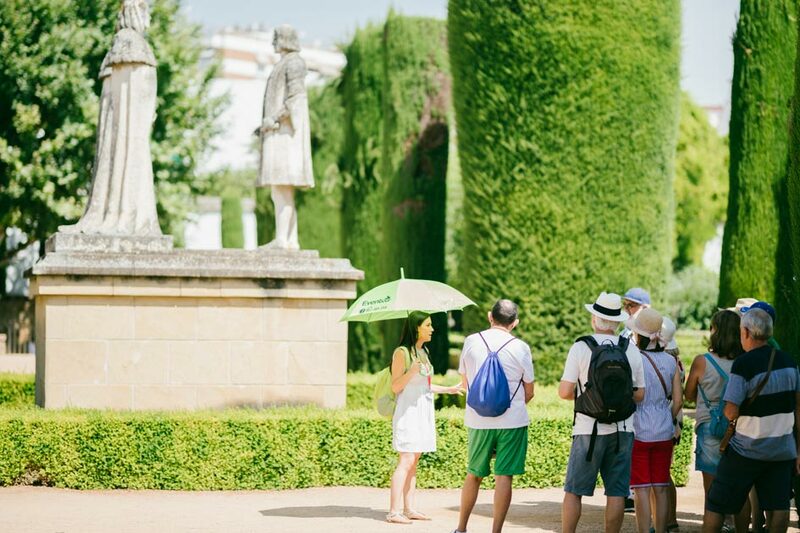 The Eventour’s guided Tours Córdoba are certainly special. We offer you different routes and sites answering to your interests and time available. You can choose between monographic, mixed or even dramatized routes. Furthermore, we offer you the possibility of private visits, focused on groups of friends or families. Moreover, we also offer you visits specially focused on groups of kids. Both you and they will be delighted. Something that differentiates us is our specialized tour guides. If you are interested in any of the specificities of the history or the cordobesian art, our professionals are trained to give you the best explanation. Dive right inside our city along our specialists. Book any of our guided tours Cordoba and enjoy it at his fullest. Eventour Córdoba is a firm composed by professionals devoted to high-quality tourism. Our main goal is to fit the single needs of each client in order to achieve its guided tour, event or experience to be one of the most marvelous experiences. Eventour offers a broad variety of guided tours for you to be able to find the one that most interest you. With us you can experience monographic tours in the Jewish Quarter, Alcazar of the Christian Monarchs, the Patios, Medina Azahara or the Mosque-Cathedral. We have also other diverse visits available like Bodegas Campos and the Equestrian show at the Royal Stables. Furthermore, with Eventour you have the chance to structure your own route. You are able to book any visit, separately or mixed as you please, just by picking the ones that most interest you and organising them as it better suits you, even if it is in separated days. Our main goal is you to enjoy at the fullest. We are conscious that in order to achieve that, flexibility as well as serenity are mandatory. Therefore, forget about rush and tight schedules and organice your own timetable and enjoy without stress. Lastly, we give you the oportunity to discover and enjoy our tours and visits privately. Get to know the city and its wonders with your group of friends or family. Specially if you have kids, we will adapt the explanations and pace in order to satisfy your necesessities and to achieve the highest quality out of the visit. Visit our website www.eventourcordoba.es to know every detail about our offers. We are sure that you will be satisfied. Book your visit through the website, the e-mail info@eventourcordoba.es or by telephone 645 363 298. Eventour Córdoba is a company of professionals dedicated to quality tourism. Our goal is to adapt ourselves to the personal needs of each client so that your guided tour, congress, event or experience is unforgettable. Our team is composed of official tourism guides and other qualified professionals in the sector.